Lucy Williams, CEO of the Kidz Kitchen camp, is one example of a new trend: the cooking-obsessed teen with an Iron Chef addiction. Tony, Serene Greenwich, Connecticut, is home to numerous CEOs, some of whom may be as intelligent, organized and resourceful as Lucy Williams. At age 13, Lucy is the CEO, CFO and creative director of Kidz Kitchen, a summer cooking camp for first and second graders. "I love to cook," says Lucy, a serious seventh grader in braids and pearl earrings, with eyes the same unearthly blue as the water in her backyard swimming pool. "I look at cookbooks, magazines, cooking shows and Web sites. I really like Rachael Ray's show Tasty Travels. I also like Iron Chef America and Barefoot Contessa. My favorite is Top Chef; it's kind of like American Idol." Lucy is part of a new generation obsessed with cooking. In February, the annual South Beach Wine & Food Festival in Miami Beach had a special kids' tent starring Food Network hosts like Alton Brown and Giada De Laurentiis. When Emeril Lagasse took the stage, the tweens in the audience screamed like they were at a rock concert. Not only do kids give cooking lessons on Webcasts at sites like Spatulatta.com, but now they are writing their own cookbooks. Rick and Lanie's Excellent Kitchen Adventures is Chicago chef Rick Bayless's collaboration with his teenage daughter; Cooking up a Storm, which is coming out next month, will introduce Americans to British sensation Sam Stern—a teenage Jamie Oliver in the making. Lucy embodies this movement as both cook and food entrepreneur. When Lucy came up with the idea for Kidz Kitchen three years ago, she immediately went to her somewhat surprised mom, Nancy Sarnoff, a freelance fashion stylist, and asked if she could start a cooking camp with arts and crafts, swimming and even medical forms. Since Kidz Kitchen uses the Williams family's kitchen, pool and backyard, it was a strategic move to get her mother on board. "I was delighted," Nancy says. "I'd already taken a CPR course, so I could be the lifeguard." To get started, then-11-year-old Lucy drafted a letter to the parents of kids at her school announcing two separate weeklong sessions "for girls only," because, she says, "I could connect more with girls and be more myself." She came up with the daily schedule on her own. "9:00: Kids arrive for camp. 9:1510:15: Cooking time. 10:3011:00: Arts & Crafts. 11:0011:30: Lawn Games/Sports. 11:3011:45: Surprise!" Pressed for an example of "Surprise!" Lucy says, "A bobbing for apples relay race with an ice-cream-sundae-eating-without-hands prize." The camp day ends with Swimming, from 11:45 to 12. "I figured the girls would be tired and want to have fun in the pool," Lucy says. But more importantly, the campers needed something to do while the food was in the oven. Lucy's favorite is lasagne, but the roster also includes chocolate pudding and a marshmallow dip she invented, which involves pretzel sticks and mini M&M's. Lucy runs a remarkably organized operation. "I try all the recipes before camp. Then I go to Costco and Whole Foods. I turn our dining room into my office. I put the ingredients for each day in their own bin. Every night, I write out what I have to set up the next day and put out all the pool toys." 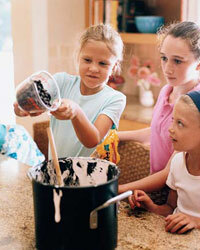 Kidz Kitchen is a profitable business. "I'm charging $175 for the week. I have to buy all the ingredients and pay for the Web site and brochure." A Web site? A brochure? Yes and yes, both of which capture Lucy's enthusiasm. So what does the future hold for Lucy foodwise? "I'd like to be part of a cooking group or take a class if I don't own my own restaurant or have a cooking show," she says with the air of a high school senior answering a college interviewer's query. But then she breaks into a grin and says, "I want cooking to be part of my life always." Helen Schulman is the author of P.S. and The Revisionist. Her new novel, A Day at the Beach, will be published next year.